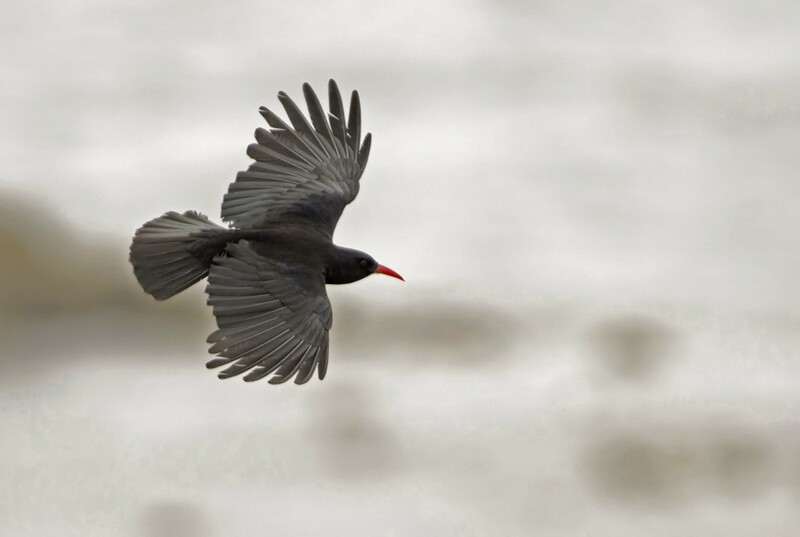 The red-billed chough became extinct in Jersey around 1900. This exciting programme of habitat restoration on the Island’s coastline will once again provide these wonderful birds with a suitable home. 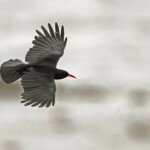 Latest news │ Monthly reports │ Seen a chough? 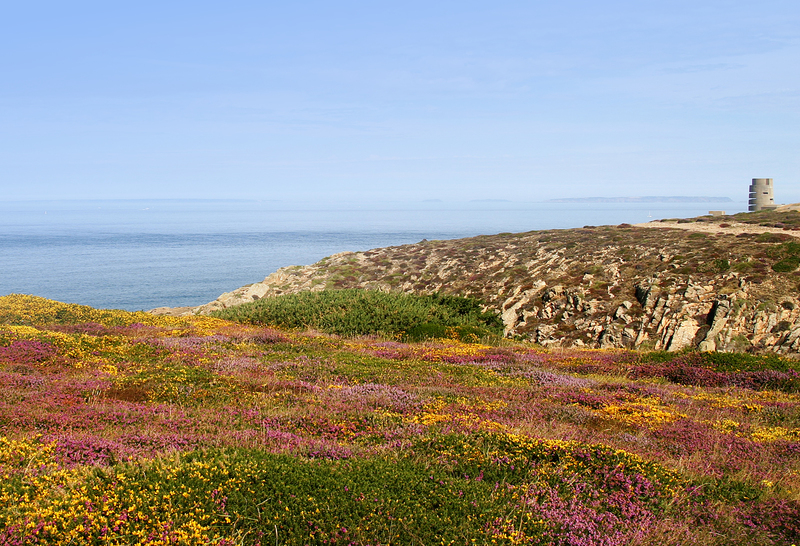 To become a flagship and focus for the state of the natural environment in Jersey. Jersey’s north coast farmland is epitomised by small sloping fields running down to the cliffs’ edge. This area is often wild and can never have been easy to farm productively. However, in it’s heyday with un-intensive farming techniques and numerous hedges, shrubby areas between the fields and sheep grazed grasslands it must have been a haven for many species of farmland birds. Sadly, the area entered a steep decline in fortunes as these forms of farming became less profitable. The abandoned fields were quickly overrun by bracken and the dense stands of this fern offer little feeding opportunity for birds. Accordingly many species once common in these fields have declined and several have died out altogether. The yellowhammer Emberiza citronella was common between Grève de Lecq and Bouley Bay as recently as the 1980s. Now it is extinct here, its distinctive song a little bit of bread and no cheese no longer heard. The last pair was recorded in 2005. Similarly, turtle dove Streptopelia turtur, skylark Alauda arvensis and stonechat Saxicola rubecula have declined and may be lost soon while meadow pipit Anthus pratensis and linnet Carduelis cannabina, once widespread, now only thrive at only a handful of protected sites. 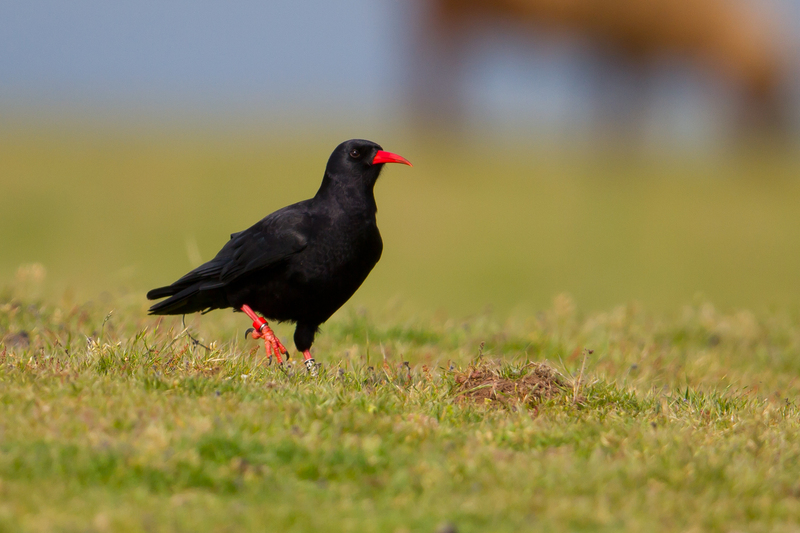 The highly charismatic red-billed chough Pyrrhocorax pyrrhocorax, with its striking long red bill and distinctive shrill call feeds on insects such as craneflies in farmland often close to the people and domestic animals that live there too. Historical numbers in Jersey are unknown, but, once found on several areas of the Island’s coastline, the chough became extinct by 1900. A similar pattern of extinction was recorded in all the other Channel Islands and the last attempted breeding may have been in Guernsey in 1929. Today the nearest colonies of chough to Jersey are in Brittany where there are around 50 pairs and in Cornwall, where the species is doing well since naturally recolonising in 2001, and on the Gower Peninsula and Pembrokeshire in west Wales. 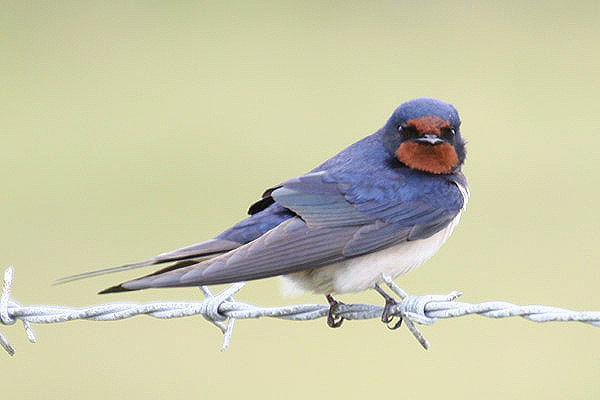 There are less than 500 pairs of this rare bird in all of the UK and the Isle of Man. 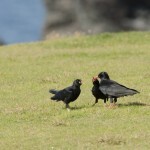 Choughs feed particularly on maritime grassland throughout the breeding season and here and on dune grassland, winter stubbles and arable lands between summer and winter. These grasslands, close to the sea are maintained by wind exposure, salt deposition and through sheep grazing. The chough likes to nest on sea cliffs but may at times use old buildings on the coast. Flocks can be seen wheeling over the sea, their high calls carrying on the wind, or probing the ground for insects on the clifftops. All may not be lost for our clifftop birds including the chough: innovative schemes will return them to our island as flagships of an improving environment and an increased understanding of the benefit of this to all islanders. Areas of the north coast will be actively managed to remove the bracken and former farming practices will be encouraged for the benefit of wildlife. 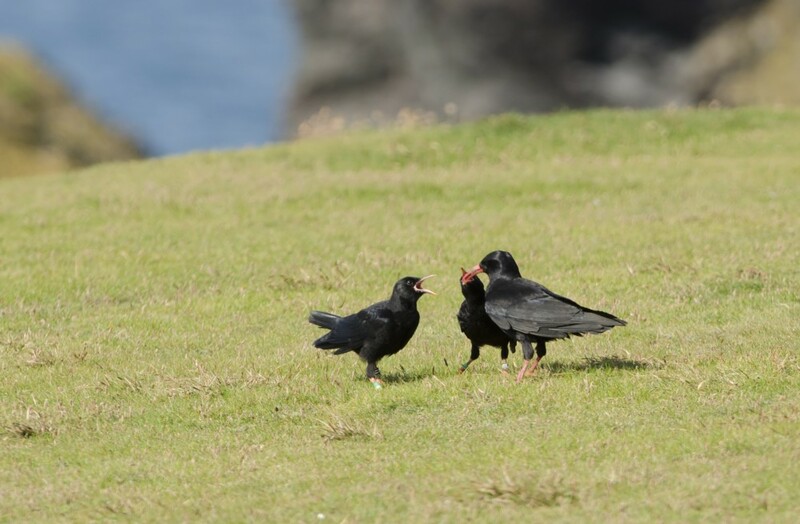 With sufficient areas of former farmland restored, choughs will be re-established using birds reared for this purpose at Durrell’s headquarters in Trinity and at Paradise Park in Cornwall. Up to five breeding pairs of choughs are managed at Durrell where they can be seen all year. 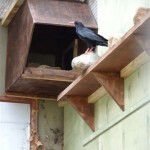 In pairs during the breeding season, all birds will be flocked together in a large aviary for the rest of the year. Birds are being released at a site on Jersey’s north coast and, initially provided with supplementary food and nest sites, closely monitored as they once again become established in Jersey. Trial releases began in August 2013. 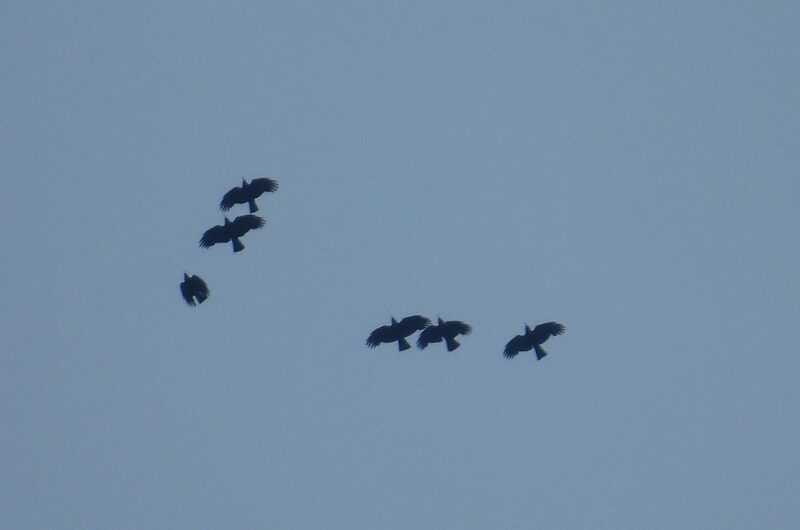 After their release, the choughs will be followed closely to see where they chose to go in Jersey and to check how they are faring. All birds will be given coloured rings so the individuals can all be identified and all will be carrying sophisticated electronics to tell us where they go and to detail their daily activities. 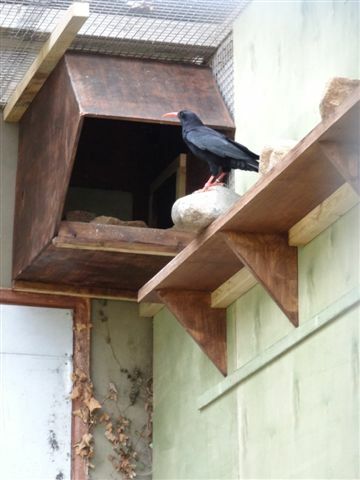 A full time chough manager will work closely with the birds from before their release and will follow them closely as they adapt to the wild. A range of different techniques will used to restore the land and these will continue even after the first choughs have been begun to fly over our coast again.